So over the past few days I've put some of my time into building a wizard. It currently stands as a 515 line user-script. And it's really still just a tech demo. Before we go any further, a screenshot of what you'll see on the Ask page if you install it. If you're just joining us and have no idea what I'm talking about, there have been several discussions in recent history that allude to the same thing: the quality of questions here is not always great. Not all users are capable of working out what to search for, and they're the people who often don't know what to include in their question. This leads to a ton of wasted time as we triage new questions. We quickly diagnose commonly recurring issues and get users to the right existing posts. They get an instant answer and they're not posting dupes. Certain wizard paths have the ability to collect data and add if they need to ask a new question, this data is added to their post. This improves quality and should help to cut down on the triage. And if it can't help, it's designed to get out of the way as fast as possible and leave the user with the standard Ask form. Quit all this dithering, man! How do I install it?! As previously mentioned, this is a userscript that we need to install in the browser. IE users go home, you're drunk. Then just visit the /ask page. But nobody is going to install a userscript before asking, how are we going to get this live on the site? I've built this to be extensible and it's open source (GPLv3) and available on Github. Ideally people would fork my version out, improve it and submit pull requests back to my branch. It is very simple code and there is technical documentation on GH and I'm available to answer questions. Failing that, I'm happy for people to leave comments and answers on here and bug reports on Github suggesting different handlers and better questions. Once we have four stubs that are actually usable, we can see about getting it included in the site. Depending on how many people get stuck in to this, we could be talking about a week or months. I guess, in this case "comment" means "answer". Thx for putting this wizard together. I love it! and think your on the right track. I believe it will be very helpful... One early glitch that needs attention. 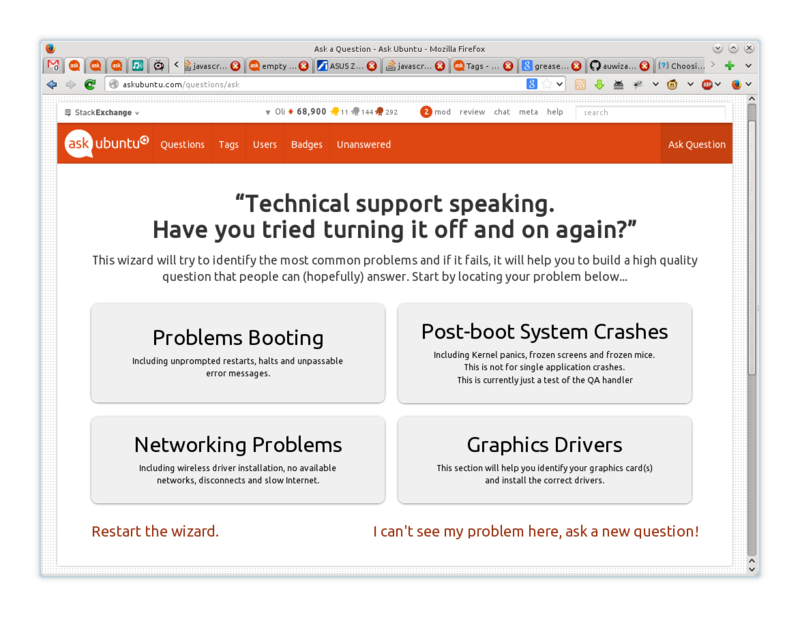 I have latest version of Firefox installed but the back ≤ftarrow; took me back to far, (here), not back one page... "Thought I was time travelling for a sec... ;-D". Keep up the good work... If I could code, I would love to help. Great Idea!! !